Although it’s been years since my graduation from pastry school, I still get so many e-mails from people interested in starting their own pastry careers. The Bay Area does not lack for professional culinary schools and pastry programs; I’ve been lucky enough to visit several but I decided to make the effort to learn more about some of the other ones and share my experiences with you. Please note that I approached these schools on my own and all opinions are mine; this is not a sponsored post and I was not compensated in any way. I am not affiliated with any professional pastry program; if you wish to learn more about how to attend a particular school, please contact them directly. The hallways of the ICC. 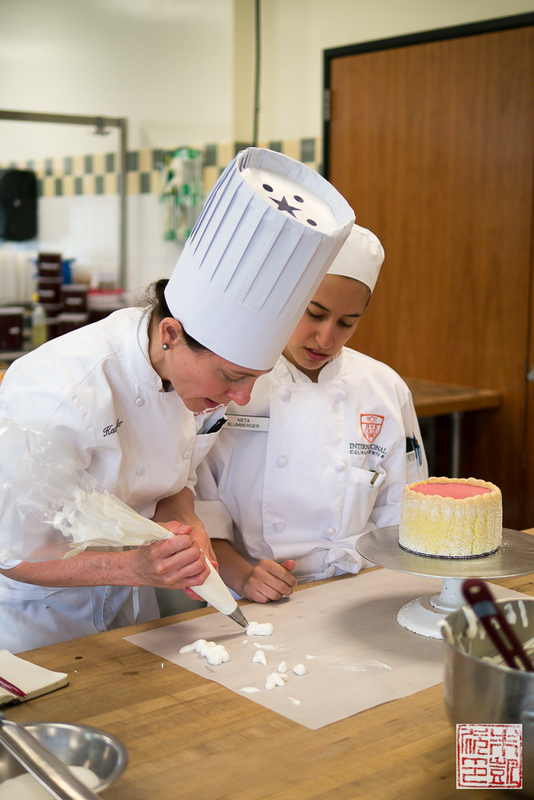 I was given a tour of the school by Chef Jeanne Neivert, the pastry arts coordinator for the California campus. This building used to be another cooking school until the ICC took over, therefore they were able to make use of the existing kitchens and equipment. 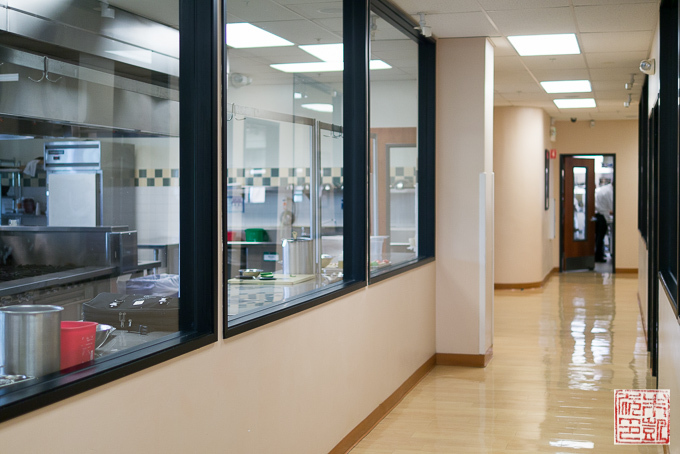 There are nine kitchen classrooms and two auditoriums that function as demonstration kitchens as well. 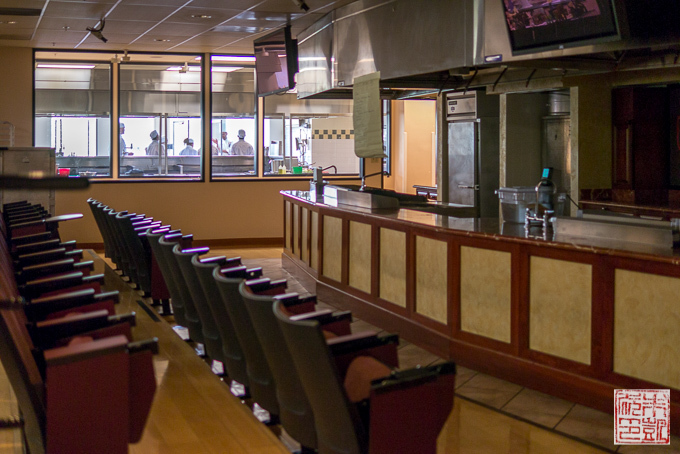 The ICC in Campbell currently offers professional culinary, pastry, and wine programs year-round. Although the ICC was founded on French culinary traditions (the pastry program is designed around the fundamentals of French patisserie), they have expanded their offering to other cuisines, including an amazing-sounding Italian Culinary Experience that give students 10 weeks in the US and 18 weeks in Italy to learn about the fundamentals of Italian cuisine. 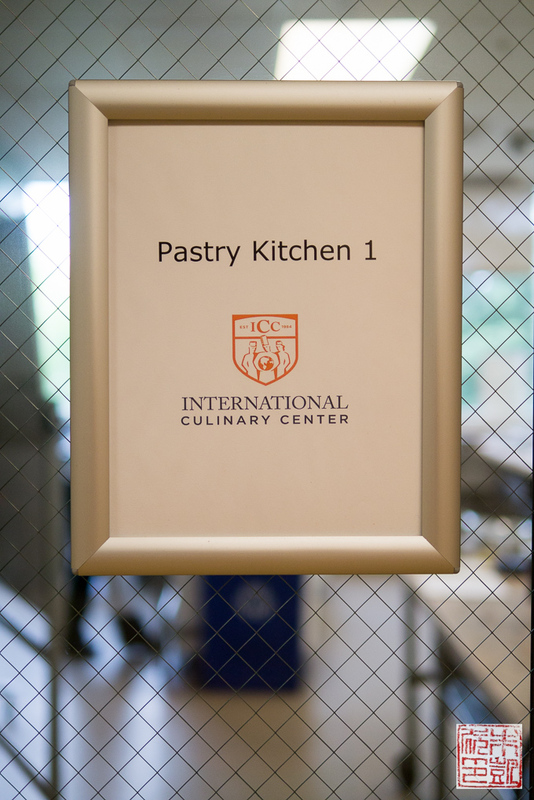 The professional pastry program at the ICC is broken up into 2 halves: Pastry 1 and Pastry 2. Together, they comprise a full curriculum of pastry knowledge, from the fundamentals like cookies to the advanced arts like sugar and chocolate work. There are two options for the program: a full time, 5 day a week, 6 month program, or a part time, 3 nights a week, 9 month program. You will learn the same material in either option. It’s obviously wonderful that they offer a part time night program so students don’t need to leave their day employment if that is their situation (I did a part time night program for my pastry schooling as well). 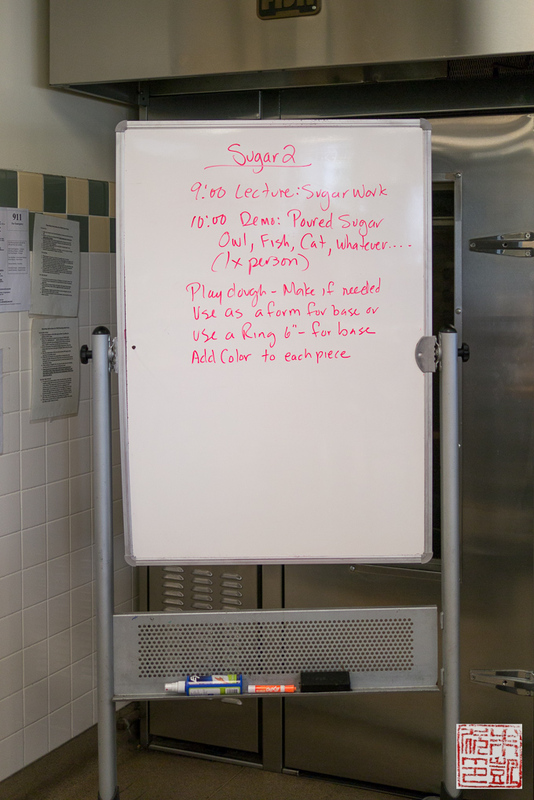 When I dropped into the Pastry 1 classroom, here was the day’s lesson plan on the board. 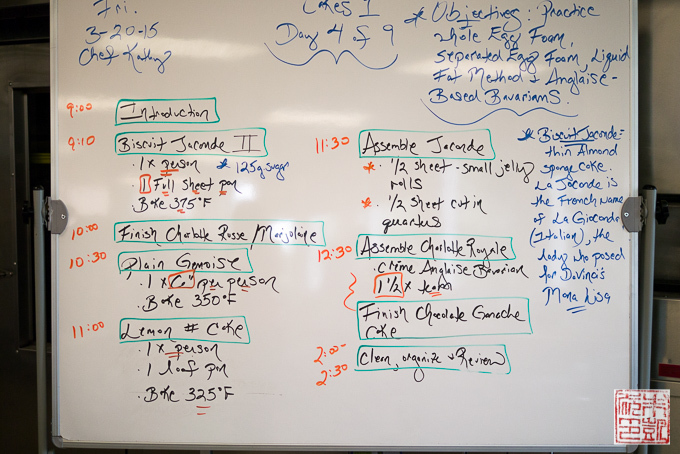 As you can see the days are packed; the instructor, Chef Kathy, explained that the program is designed to be fast-paced and there are almost always several projects going on in one day’s session. This helps maximize time since while one cake is cooling you can finish another cake you started yesterday, or start prep for another dessert. It also provides students a chance to practice techniques on different desserts. 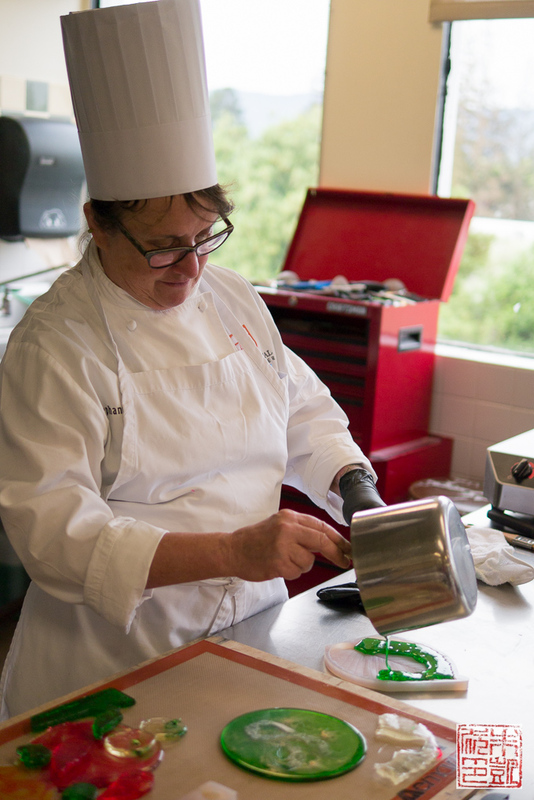 Chef Kathy demonstrating how to pipe whipped cream to decorate the raspberry bavarian charlotte. If you look at the class schedule, the students had already assembled the charlottes in a previous class and now have to finish them. Most classes have about 14-16 students, which allows plenty of individual attention from the instructors. This particular class had fewer students than usual (they mentioned that different times of year tend to be busier) so Chef Kathy spent a lot of time working with each student to troubleshoot and offer advice. A closeup of the finished charlotte – just gorgeous. And tasty, too! I asked Chef Kathy what students did if they felt like they needed more practice with a certain skill or recipe. She replied that it was expected that students practice both in and out of the classroom, and they were welcome to schedule extra time in the classroom outside of class, and to ask instructors for help. It’s great that the school encourages students to keep honing their skills and allows them to make the most use out of the facilities while they are there. During my tour I also spoke with Rachel Thompson, the admissions director. I get a lot of e-mails from outside the US, asking for advice on getting into pastry school. As Rachel explained to me, the great news about ICC is that they have a dedicated department to helping out international students. If you go to their website and click on International Students, there is information on how to obtain any necessary visas, other education/age requirements, and financial aid. 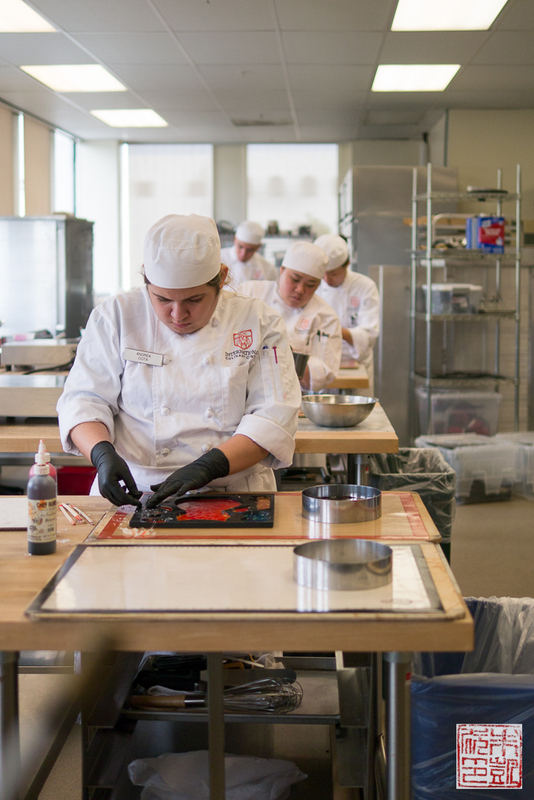 There are staff at the ICC who specialize in helping international students navigate the complicated challenge of getting into the US to attend culinary school. Not all culinary schools have such resources or are as proactive about assisting prospective students, so I would highly recommend that anyone from outside the US who is unsure about how to get into pastry school here take a look at the ICC – even if you don’t come here, their website offers a lot of very useful information. Near the end of the morning session for Pastry 1, the class is finishing up a chocolate ganache cake started in a previous session. They have to glaze and then decorate the cake. 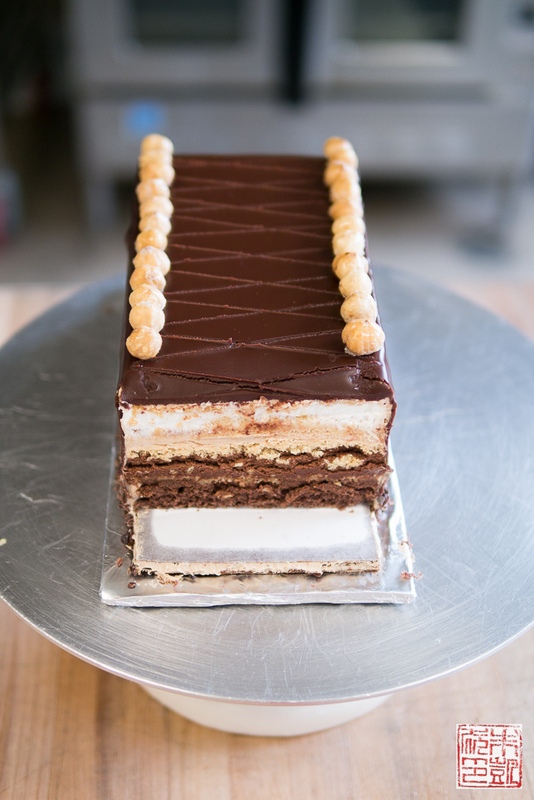 This particular cake, the marjolaine, is an French classic, made with layers of almond and hazelnut dacquoise and chocolate buttercream (if you see the top photo in this post you can see the layers). 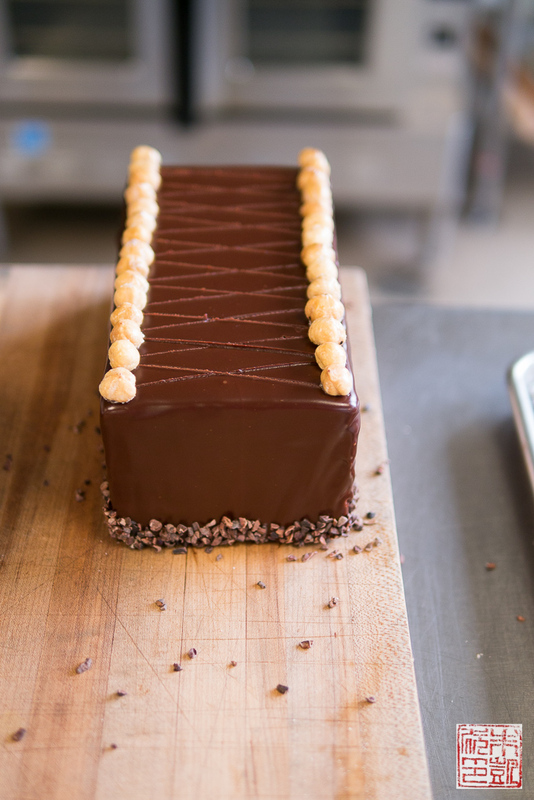 It is complex, elegant, and like all French desserts, devastatingly rich; just a thin slice will more than fill you up. 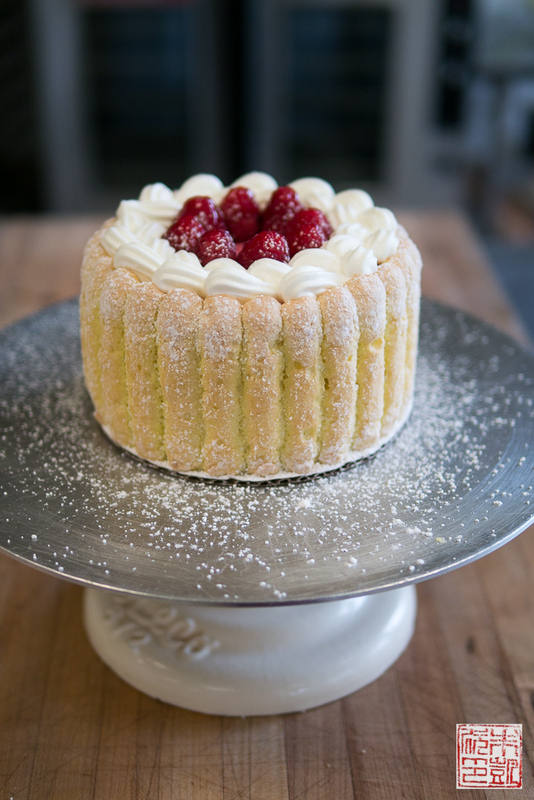 I loved watching Chef Kathy’s precision in decorating this cake, from the smooth perfection of her glaze to the precision of her scoring on the top of the cake. Her effortless skills make her an inspiring example for new students, and her patience and encouraging manner make her an ideal instructor. She took the time to patiently answer all my questions while she was teaching her class, and her clear enthusiasm for the pastry arts made me feel like I would definitely enjoy learning from her. A shot of one of the auditoriums, with more classrooms beyond. I also stepped into the Pastry 2 class, which was being taught by Chef Stephany. One thing I really loved about the ICC was how big, well-equipped, and light-filled the classrooms were. You can see there’s plenty of workspace for all the students, and the equipment was plentiful and well-kept. 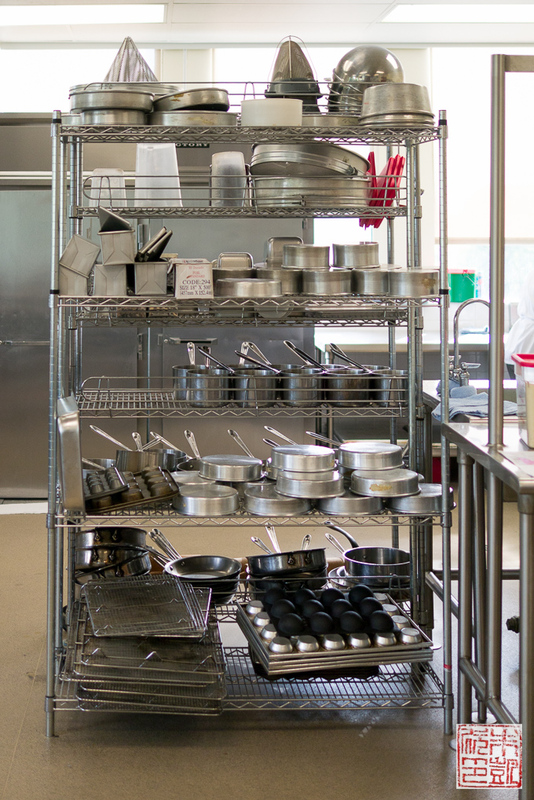 They are beautiful, functional places to bake and learn, which is key to enjoying your pastry school experience. The Pastry 2 class was focused on sugar work. 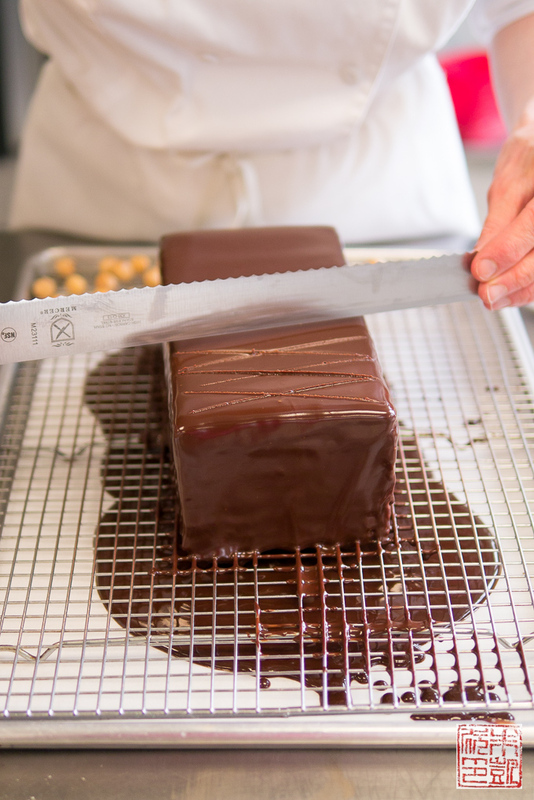 Chef Stephany told me how she enjoyed passing on these classic, old-school pastry techniques. Although fancy sugar and chocolate showpieces don’t show up often in restaurants these days, most pastry schools consider it important that pastry students are exposed to the techniques and have the experience of doing it a few times at least. I didn’t get to learn sugar work or make a large-scale chocolate piece at my pastry school, and part of me does regret missing out on doing it. So I’m glad that there are pastry schools still preserving these beautiful skills. 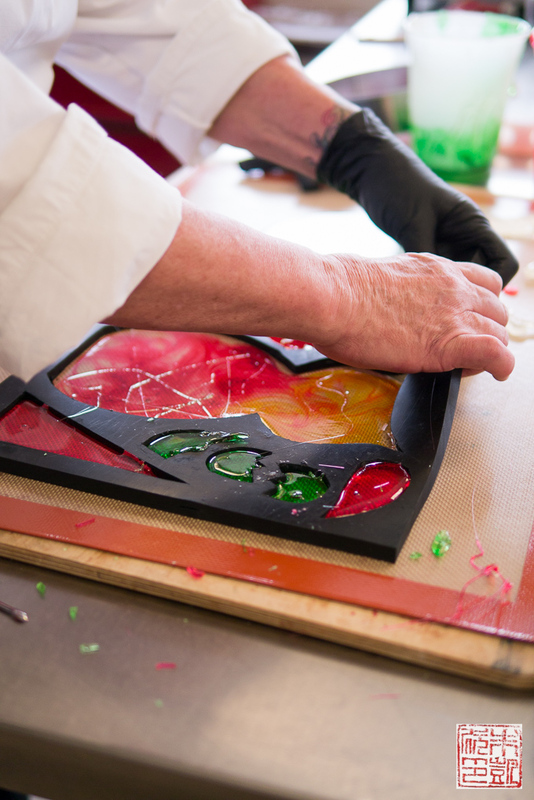 Here’s Chef Stephany pouring out colored sugar into molds. 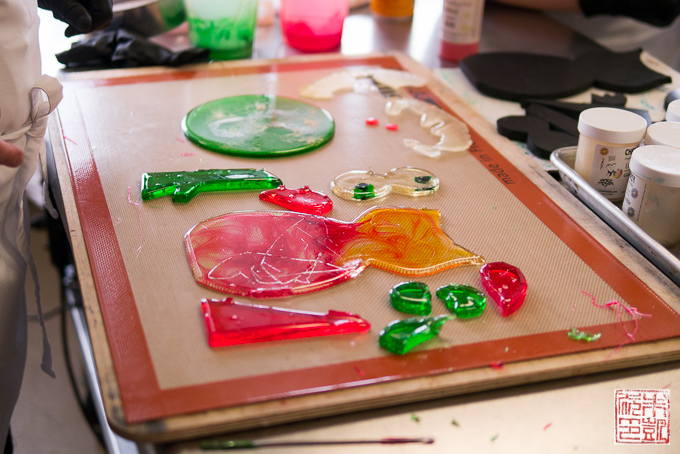 This first lesson was an initial introduction to coloring and molding sugar. The next few lessons would involve more intensive techniques like blowing and pulling hot sugar, and finally assembling a full sugar showpiece. I’m sorry I missed seeing those classes! The ICC regularly holds open houses where anyone interested can visit the campus and ask questions of the admissions staff. In fact, they highly encourage anyone who is seriously considering the ICC, or pastry school in general, to make a visit and see if professional pastry is right for you. Because it’s such a big commitment of time and effort on everyone’s part, it’s just as important to the ICC that all entering students are confident in their decision and ready to start learning. Rachel informed me that the ICC even offers a reimbursement of your transportation expenses to visit the campus, if you end up enrolling in a program. What better incentive to check the ICC out? Pastry 2 students hard at work. I got the chance to speak with a few of them during class and I asked why they chose the ICC. Most of them replied that they liked the facilities when they came for a tour and a curriculum that was compact but comprehensive. As an accredited program, the ICC has information on class sizes and graduation statistics available on request, and they have a very high graduation rate. The ICC also offers lifelong job placement assistance – strong alumni support is a big plus for a school. Here are the various poured sugar pieces, ready to be assembled into an owl. Unfortunately I couldn’t stay long enough to see the final assembled piece, but I enjoyed watching the classroom in action! Besides the professional programs, there are also short workshops and classes for enthusiasts who aren’t looking for professional training. Also, for those of you with kids interested in pastry (I also get e-mails from high schoolers asking how early they can start pastry school!) 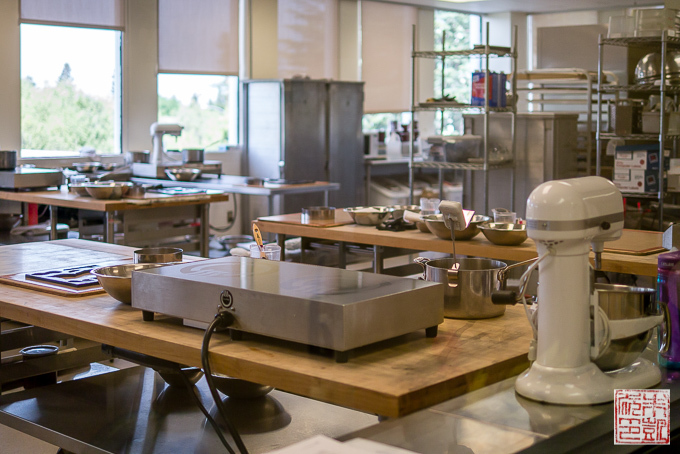 the ICC also offers summer pastry camps – a week of intensive pastry instruction to future your teen’s love of baking. I’m impressed with the breadth of the ICC’s offerings and they also hope to continue to increase their catalog of courses in the future. Thanks to Chefs Jeanne, Kathy, and Stephany for letting me visit the pastry program, and thanks for Rachel Thompson for speaking to me about the admissions process. 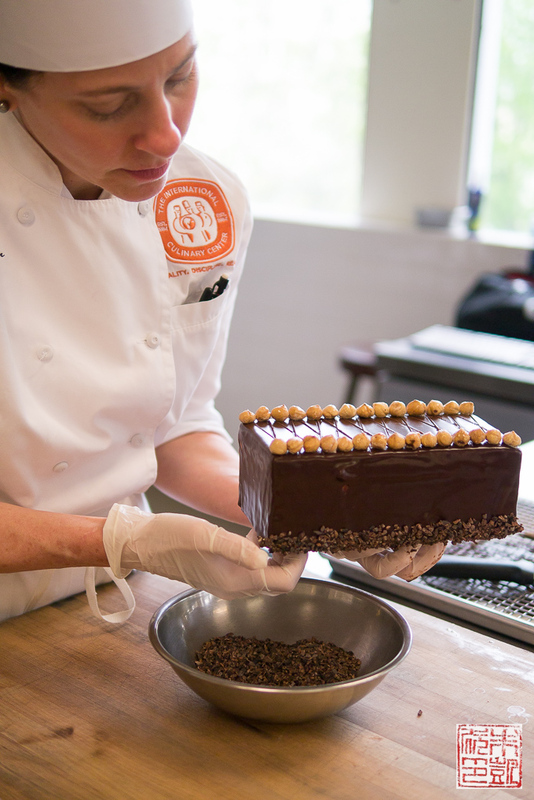 I’m excited I got the chance to learn about another excellent professional pastry program in the Bay Area, and I hope this information is helpful to all you aspiring pastry students! I love the idea of the ” Italian Culinary Experience that give students 10 weeks in the US and 18 weeks in Italy to learn about the fundamentals of Italian cuisine.” which I certainly would have signed up for had they offered that at Le Cordon Bleu when I attended although my studies focused on French pastry so surely they would have had French study over Italian. That would have been great! Lovely article with fantastic and delicious looking photos. Great job! great post. The school looks amazing. I would recommend doing pastry and even a day course in something.